Another interesting photos sent to us by Mohammed Luqman from Hyderabad-Deccan (India) who investigates unusual car photos of ancient vehicles in India. 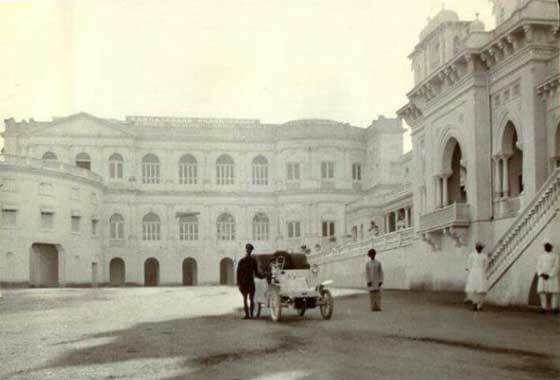 Can we identify this car headed 'Veteran car at Falaknuma'. -- Unfortunately this photo is FAR TOO SMALL to allow any degree of certainty and we therefore requested a better scan. Regretfully we received no answer. Our best guess is a cca 1903'04 De Dion Bouton, undoubtedly one of smaller models, perhaps a 'Populaire'? Our regular contributor Mark Dawber (New Zealand) was intrigued by this photo he found on the internet and wondered if it is a Crestmobile. -- Our knowledgeable expert Ariejan Bos who has a system for identifying obscure early cars advised it was an American car made in Kalamazoo by the Blood and Fuller Brothers combining to form Michigan Automobile Company, this being a cca 1904 Michigan 3.5 Hp Model A Runabout, driven by Buffalo Bill, and mis-identified as an Oldsmobile. Our regular contributor Mark Dawber (New Zealand) was intrigued by this photo he found on the internet, suggested as a Tourist, but he doubted it. 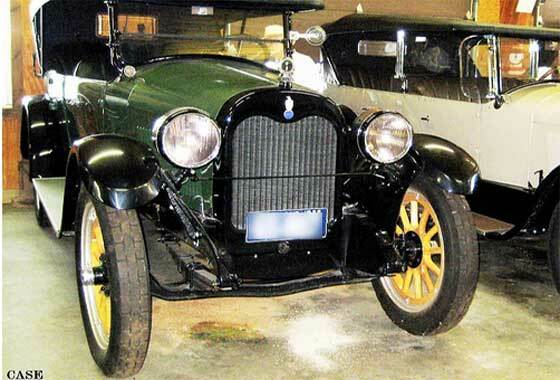 -- Our knowledgeable expert Ariejan Bos who has a system for identifying obscure early cars advised it was an American car but not a Tourist. This is a cca 1905 Jackson, probably a Model C, or model D; bonnet top-lid of a C, but D dumb irons. The Jackson was preceded by the ‘Orlo’ car in 1904, Jaxon steamer 1903, and Jackson C in 1905. A rather damaged family photo found in our own family albums (UK) but unfortunately nobody seems to know who the gentleman is, if he is part of the family, or if the car was owned by anybody in the family. Much like many other family albums; nobody made a note and they are all now gone! -- The car is easily recognisable by the wrap-round radiator coils but the bodywork seem unusual for this car in this period: a cca 1905 Wolseley 12HP Landaulette, as designed by Herbert Austin. 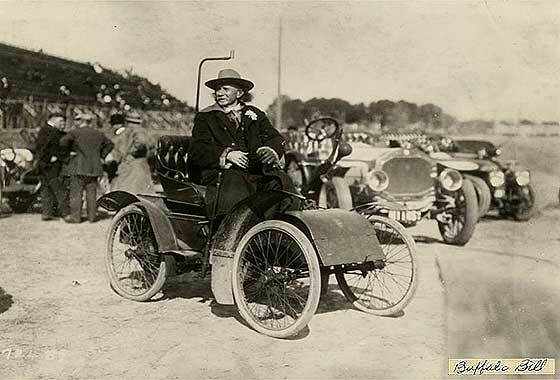 Photo posted on AACA website by Carsnz saying photo turned up on his Facebook feed. Apparently it was taken some time in 1917 in Germany. 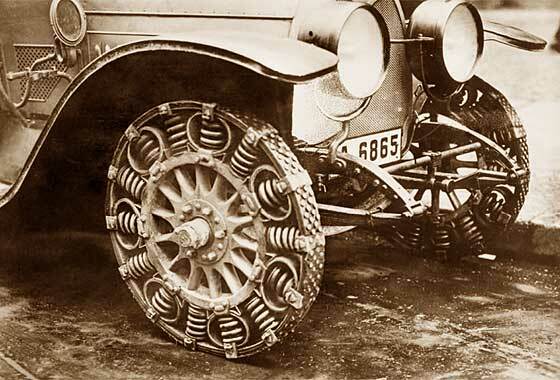 It was a novel approach to solving the rubber shortage after WW1. So what is the car they're mounted on?! -- We have had 'elastic wheels' before so know this one is mounted on a German cca 1916 Protos G Tourer of the WW1 period, possibly military use. Variations on the sprung wheel came in many forms, some even current on cycles today. A rather damaged family photo received from Bob Romness, of Lincoln, (USA) saying, 'So glad I found your site. My mom is sitting on the ground, and her brothers are on running board and driver's seat. Photo is from 1921. Can you identify the year and make of the car? Thank you so much for your help.' 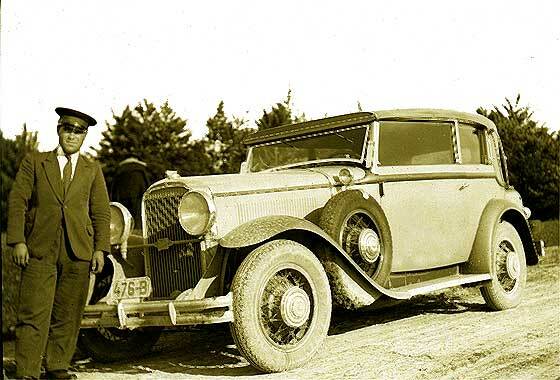 -- We have partially repaired the photo and our Mark Dawber confirmed our view that this is a big Studebaker. Further research suggests this is a cca 1916 Studebaker Model ED Six Touring. Lovely family group photo received from Art Zimmerman (USA) believed mid 1920. Originally from Ukraine, near Kiev, Grandfather Joseph Sklar, far left and wife Julia with baby; others are kids of siblings. 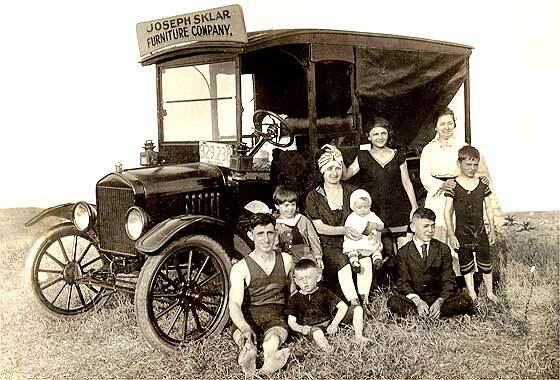 By 1919 Joe is listed as owner of furniture store at 14 W. French Avenue in New Bedford, Massachusetts. By 1922, Joe & Julia are in Brooklyn. -- Transverse spring, non detachable wheels, no undertray by starting handle, dates as cca 1919 Ford Model T Depot Hack (taxi). Surfing through the internet in attempting to identify old vehicles we came across a photo of a car that appears to be misidentified on a number of separate pages even though the correct name appears in small print on the photo -- One of the problems with current fashion of 'photo sharing' is that a mistake on one site can within minutes be easily transmitted word wide and confuse all manor of researchers. 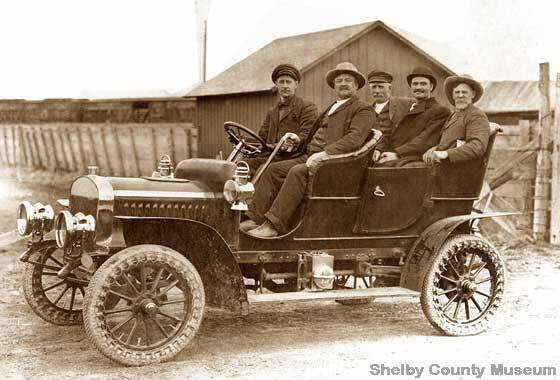 This is a photo of a cca 1920 Case Touring, - misnamed 1916'17 Maxwell Touring. One of a batch of lovely photographs sent to us by Christopher Cope (UK) found in his family archives. This branch of their family always lived in and around Reading, Berkshire, and as far as they know the cars were all British made. Talk of a Bullnose Morris. 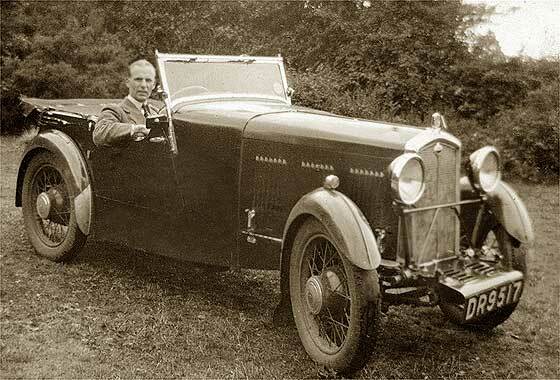 -- Our 'Morris Man' Chas Moody advises it is a late 1924 or early 1925 Morris Cowley Tourer; Two-piece windscreen '24. Wellbase tyres late 24, no front brakes until 25, no tie bar between front dumb irons until 24; door beading ends 25. 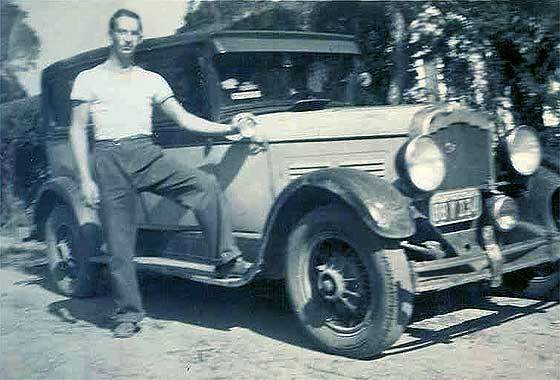 Surfing through the internet in attempting to identify old vehicles we came across a photo of a car with a puzzling radiator top shape but unfortunately we did not seem to have made a note of the photo origin so now cannot give any background. -- Swirls on the top of the radiator surround with no badge, two sets of horizontal louvers, needed further investigation. This is cca1928 REO Wolverine Sedan, assembled car with Continental engine made for two years in parallel with the Flying Cloud. One of a batch of lovely photographs sent to us by Christopher Cope (UK) found in his family archives. This branch of their family always lived in and around Reading, Berkshire, and as far as they know the cars were all British made. No idea on this car. 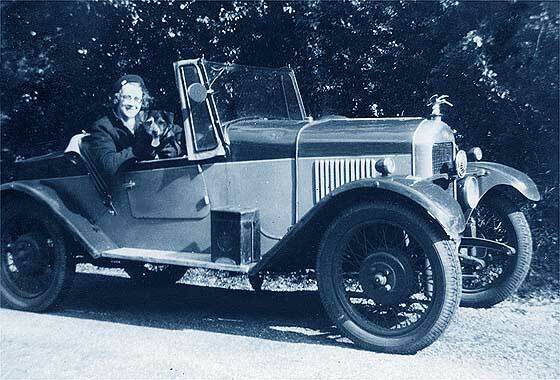 -- Striking car " named after the 100 ascents of Porlock Hill Somerset in 1928 by a Singer Junior 8HP Sports 2-seater. A new model appeared to celebrate in 1929 called the "Porlock Sport" with a higher and rather an unpleasant looking body". Cinema screen grab taken from an Italian Film "Tempo di Uccidere" (Time to Kill) made in 1989 where cars are being investigated by IMCDB. 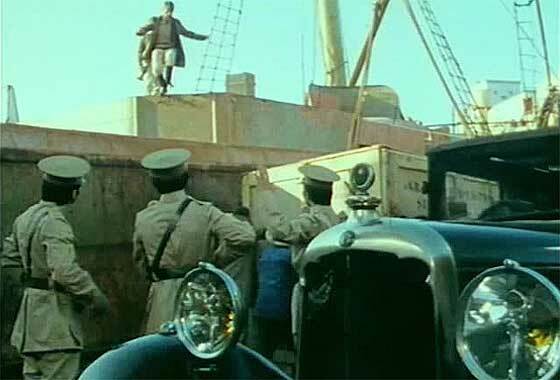 Story about the 1939 Italian invasion of Ethiopia and a Lieutenant who gets into some nasty situations. -- Made in Turin Italy between 1928-31 and also in Germany at the Fiat-NSU plant in Heilbronn. Over 33000 were made. This is a commercial version of the vehicle also made for the Military and is a cca 1930 Fiat 521 Furgone Carcerario (Prison Van). Another fascinating photograph from our regular contributor Cicos Florin in Constanta by the Black Sea (Romania) who is interested in old cars of Romania. Do we know what the vehicle is? -- American car again, built by one of the oldest US makers founded 1899, becoming General Motors. From the shape of the radiator, lights and tie bar this is a cca 1931 Buick 8-67 Victoria Cabriolet, body by Glaser Karosserie of Dresden. After WW2 Glaser was KWD East Germany: IFA / Wartburg. One of a batch of lovely photographs sent to us by Christopher Cope (UK) found in his family archives. This branch of their family always lived in and around Reading, Berkshire, and as far as they know the cars were all British made. This car could be as Wolseley Hornet. -- DR 9517 is a Devonport, later the Plymouth CBC. The car is a Wolseley Hornet; many were supplied in chassis form to specialised coachbuilders. We are relatively sure this is cca 1932 Wolseley Hornet Abbey AS3 Special. Another very interesting photograph sent to us by Andrew Kostin from Moscow (Russia) who is a collector of old photos. Judging from the number plate, the photo was taken in the USSR between 1946 and 1959, when yellow number plates had been used. From two letters on the plate, vehicle was used in the Georgian SSR. -- Car was manufactured by a company established in 1896 in Chemnitz. From the radiator, louvres and double side windows, this is c1934 Wanderer W22 Cabriolet. 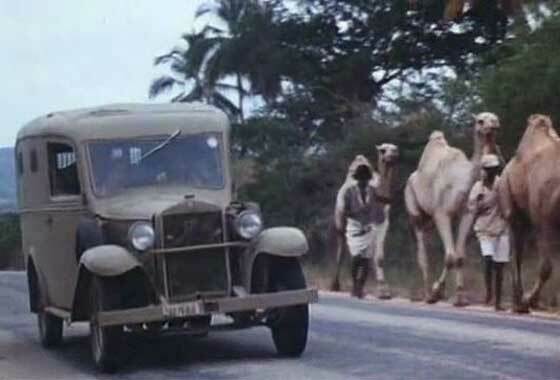 Another interesting photos sent to us by Mohammed Luqman from Hyderabad-Deccan (India) who investigates unusual car photos of ancient vehicles in India. 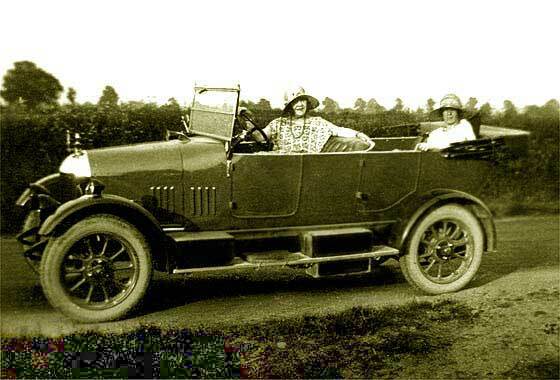 Can we identify this car headed 'Azam Jah's Tourer'. 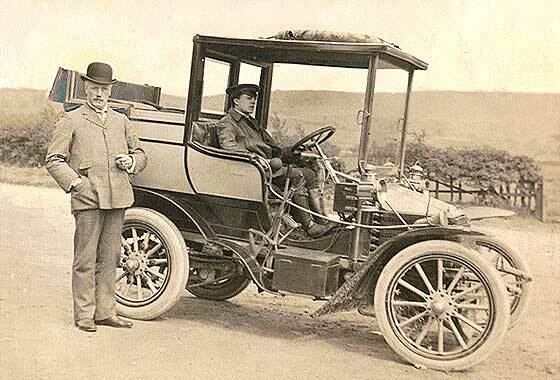 -- This is an American car manufactured by a restructured company resulting from the Henry Ford Company he left in 1902. The sidelights below the headlamps and the sprung two bar bumper date this accurately to being a cca 1934 Cadillac 355 D Convertible Sedan. Cinema screen grab taken from taken from a Spanish film German Mini-Series " La virgen de la lujuria" (The Virgin of Lust) made in 2002 where cars are being investigated by IMCDB. Story of a native Mexican to kill Franco. 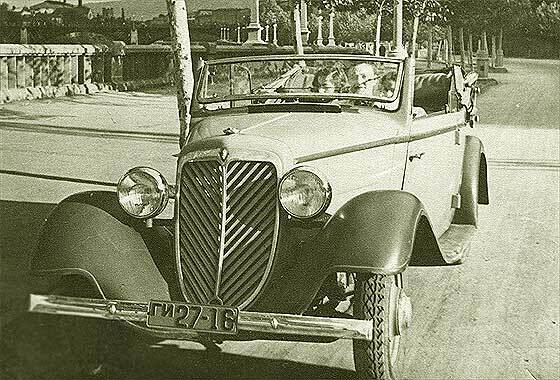 -- Big car which seems to have been given to Francisco Franco by Miguel Mateu y Pla the son of car company founders and his ambassador in Paris. 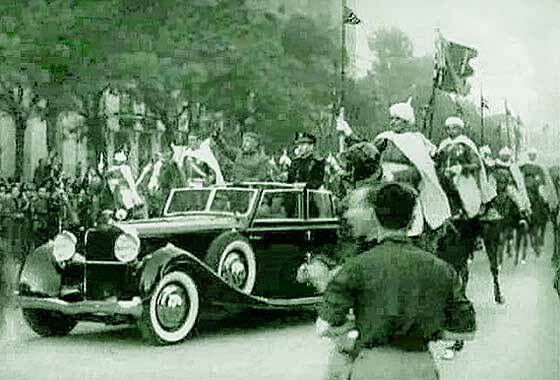 This is a cca 1936 Hispano Suiza J12 Cabriolet Vanvooren, triumphantly entering Madrid in victory parade May 1939. Another very interesting photograph sent to us by Andrew Kostin from Moscow (Russia) who is a collector of old photos. This photo was taken in Sochi, the site of the 2014 Winter Olympic Games and now also the home of the Russian Formula 1 Grand Prix. -- This is a French car which was manufactured in Quai de Javel, Paris by a company established in 1919 by André-Gustave Citroën. From the bonnet and large hub caps (but mis-matched wheels) this is a cca 1939 Citroen 11 Traction Avant. Another very interesting photograph sent to us by Andrew Kostin from Moscow (Russia) who is a collector of old photos. This photo was taken in Mexico, in Victoria de Durango. -- Victoria de Durango is 100km inland from Mazatlan and attracts close to one million visitors each summer for its annual month-long Feria Nacional De Durango, since 1929. 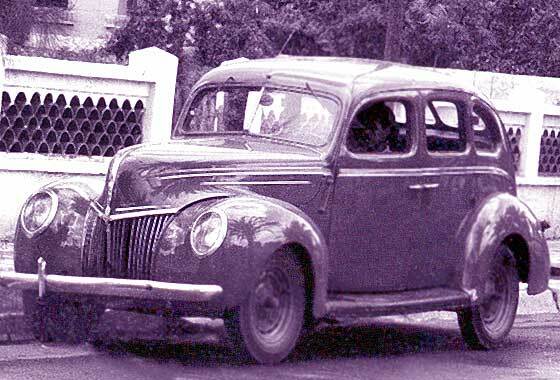 The car is American, although there was then local Mexican assembly plant, and from the vertical grille bars is a cca 1939 Ford Fordor Deluxe Sedan. Another very interesting photograph sent to us by Andrew Kostin from Moscow (Russia) who is a collector of old photos. This photo was taken in Mexico, in Mazatlan. 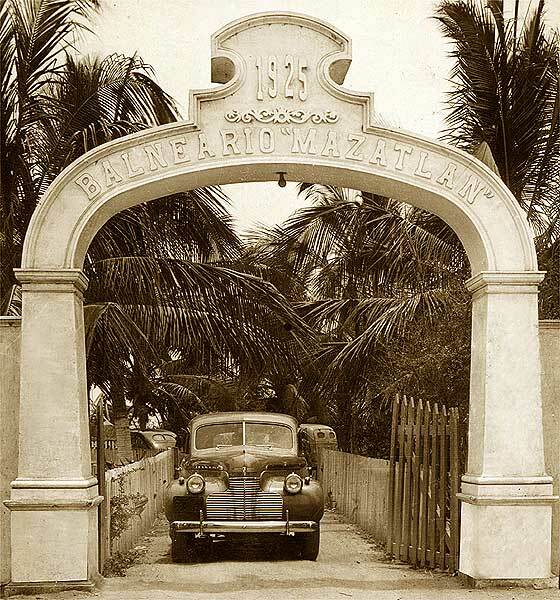 -- Mazatlan meaning 'place of deer' is half way down Mexico on the Pacific coast and founded in 1531 to serve the local gold and silver mines. Now a popular tourist destination, with its beaches lined with resort hotels. The 'Balneario' is a watering spa resort. The car is American, a cca 1940 Chevrolet Master Deluxe Sedan. Another of a number of interesting photos sent to us by Andrew Kostin from Moscow (Russia) who is a collector of old photos. 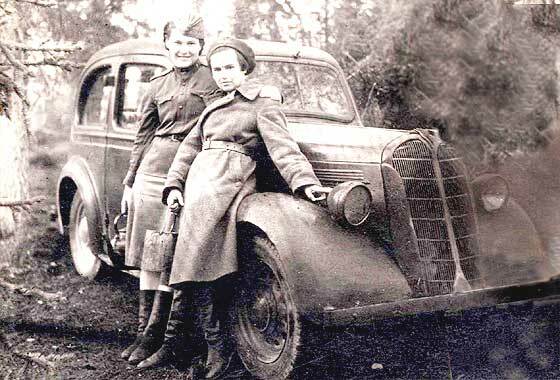 Can we identify this vehicle photographed in late 1940s somewhere in the Soviet zone of the occupied Germany? -- This is a rather puzzling photo because it shows an 'occupied' British car in the Soviet Zone, whereas they should have been on the same side? 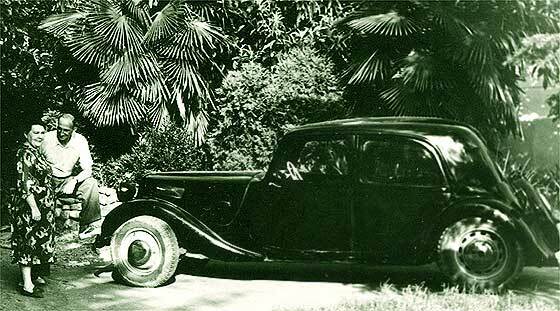 Anyway, the car is a cca 1940 Standard Flying Nine Two Door Saloon. Standard also made WW2 'Tillie' pickups. 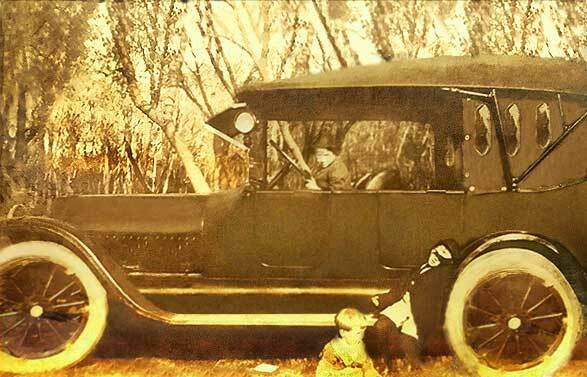 Photograph posted on the PreWarCar website by Jered Dodge saying he has a vintage front bumper that he cannot seem to find photos of on any cars or pickups. Can we suggest a way to find what it belongs to? 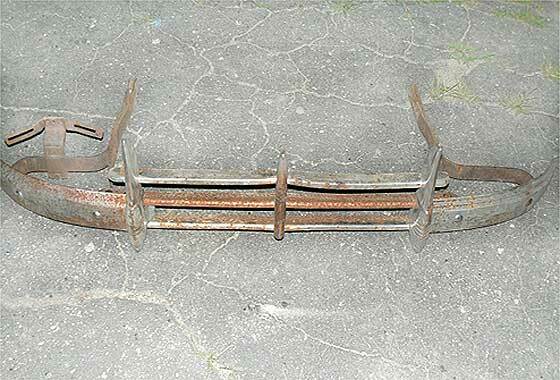 -- Obviously not a Vintage bumper but one from the 1940s. The pattern of the bumper corresponds to a number of models of the cca 1940 Pontiac. It was been fitted to Sedans, Estates Roadsters and Coupes. Some models in the range seem to have had only two horisontal bars. Another very interesting photograph sent to us by Andrew Kostin from Moscow (Russia) who is a collector of old photos. 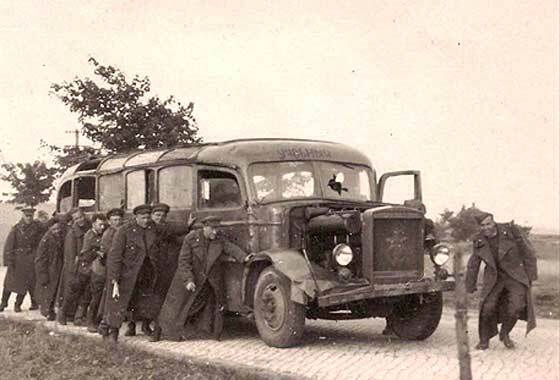 Can we identify this vehicle photographed in late 1940s somewhere in the Soviet zone of the occupied Germany? -- Another rather puzzling photo because it shows a car that has many of the features of being an Austrian Steyr of the type 50'55 but having four doors. 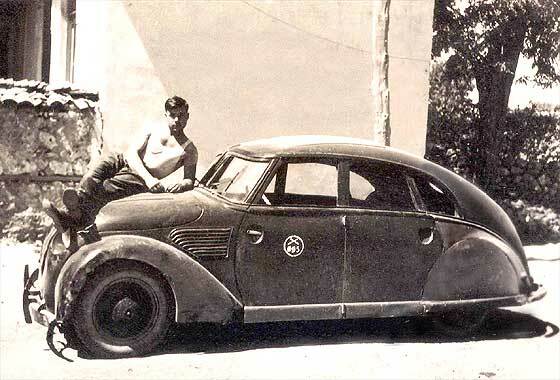 There was a 1936 Steyr 530 with similar features and had bespoke bodywork so this may be one of them. Another very interesting photograph sent to us by Andrew Kostin from Moscow (Russia) who is a collector of old photos. Can we identify this vehicle photographed in late 1940s somewhere in the Soviet zone of the occupied Germany? -- Another rather puzzling photo which shows a radiator top pattern used by the Wehrmacht for some of their military WW2 lorries and busses. Andrew feels it may be a Krupp OD 3,5 and the outline of the logo suggests it may well be. Also used by Mercedes Benz.